Investigative journalists and citizens interested in uncovering organised crime and corruption that affect the lives of billions worldwide gain, with each passing day, unprecedented access to information. Huge volumes of data are made available online by governments and other organzations and it seems that much needed information is more and more in everyone’s grasp. However, at the same time, corrupt officials in governments and organised crime groups are doing their best to conceal information in order to hide their misdeeds. They make efforts to keep people in the dark while conducting ugly deals that cause disruptions at all society levels and lead to conflict, famine or other types of crisis. It is the duty of investigative journalists to expose such wrongdoings and by doing so to disable corrupt and criminal mechanisms. There are three main guidelines that, if followed, can lead to good, thorough journalism when investigating major acts of corruption and crime even in the most austere of environments. In many instances it is much easier to get information from abroad than from within the country where the investigative journalist operates. Information gathered from abroad via foreign information databases or by using other countries' access to information laws might be just what is needed to put the investigative puzzle together. On top of that, criminals and corrupt officials don’t keep their money in the place they stolen it from. They would rather deposit it in foreign banks or they would rather invest in other countries. Crime is global. Databases that assist the investigative journalist in tracking the money worldwide can be found in many places on the Internet. 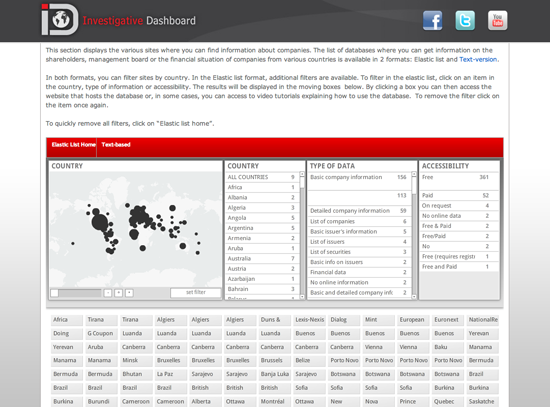 For example, the Investigative Dashboard enables journalists to follow the money across borders. Investigative journalists all over the world are grouped in organzations such as The Organized Crime and Corruption Reporting Project, The African Forum for Investigative Reporting, The Arab Reporters for Investigative Journalism, The Global investigative Journalism Network. Journalists can also make use of professional journalism platforms such as IJNet where global journalism related information is exchanged on daily basis. Many of the reporters grouped in networks work on similar issues and confront similar situations so it makes a lot of sense to exchange information and methods. Emailing lists or social network groups are attached to these networks so it is quite easy to get in touch with fellow journalists and to ask for information or advice. Investigative stories ideas can also be gathered from such forums and emailing lists. Software helps investigative journalists access and process information. Various types of software assist the investigator in cutting through the noise, in digging and making sense of large volumes of data and in finding the right documents needed to break the story. There are many ready-made software programs that can be used as tools for analyzing, gathering or interpreting information and, more important, investigative journalists need to be aware that there are scores of computer programmers ready to help if asked. These programmers or hackers know how to obtain and handle information and they can assist a big deal with the investigative effort. These programmers, some of them members of global open data movements, can become invaluable allies in the fight against crime and corruption. They can assist journalists in gathering and in analyzing information. A good example of an interface between programmers and citizens is ScraperWiki, a site where journalists can ask programmers for help with extracting data from websites. Investigative Dashboard maintains a list of ready-made tools that could help to journalist gather, shape and analyze data can be found here. The usefulness of the above-mentioned guidelines has been visible in many instances. One good example is the work of Khadija Ismayilova, a very experienced Azeri investigative reporter who works in a very austere environment when it comes to information access. Ms. Ismayilova has to overcome obstacles on daily basis in order to offer the Azeri public good and reliable information. In June of 2011, Khadija Ismayilova, an investigative reporter with Radio Free Europe/Radio Liberty’s (RFE/RL) Baku based office reported that the daughters of the Azeri president, Ilham Aliyev, secretly run a fast rising telecom company Azerfon through offshore companies based in Panama. The company boasts nearly 1.7 million subscribers, covers 80 percent of the country’s territory and was, at the time, Azerbaijan’s only provider of 3G services. Ismayilova spent three years trying to find out who were the owners of the telecom company but the government refused to disclose shareholder information and lied numerous times about the company’s ownership. They even claimed that the company was owned by the German based Siemens AG, a claim that has been flatly denied by the German corporation. The Azeri reporter managed to find out that Azerfon was owned by a few Panama based private companies and this seemed to be a dead end to her reporting until help from outside was employed. In early 2011, Ms. Ismayilova learned, through the Investigative Dashboard that Panama based companies can be tracked down through an application developed by programmer and activist Dan O’Huiginn. It was then when she finally managed to uncover the fact that the president’s two daughters were involved with the telecom company through the Panama based entities. In fact, O’Huiginn created a tool that helped journalists from all over the world to report on corruption as Panama, a very well known offshore haven, has been widely used by corrupt officials from all over as a place to hide stolen money: from cronies of the former Egyptian president, Hosni Mubarak to dirty officials in the Balkans or in Latin America. What the programmer-activist has done is called web scraping; a method that allows the extraction and reshaping of information so that it can be used by investigators. O’Huiginn scraped the Panama registry of companies because this registry, although open, only allowed searches if the investigative reporter knew the name of the commercial company he or she was looking for. This limited the possibility to investigate as usually reporters look for names of persons in order to track down their assets. The programmer extracted the data and created a new web site where names-based searches are also possible. The new web site allowed investigative reporters in many countries to fish for information, to run names of officials in governments and Parliaments and to check if they secretly owned corporations in Panama just as the family of the Azerbaijan president. There are other advantages to using the guidelines highlighted above, besides better access to information. One of them has to do with minimising harm and insuring better protection for investigative reporters who work in hostile environments. This is due to the fact that when working in a network the journalist is not alone, the investigative reporter works with colleagues in other countries so it is harder for criminals to pinpoint whom they think is guilty for their wrongdoings being exposed. As a result, retaliation by governments and corrupt officials is much harder to achieve. Another thing to be kept in mind is that information that doesn’t seem very valuable in a geographical area might be crucially important in another. The exchange of information over investigative network can lead to breaking very important stories. For example, the information that a Romanian was caught in Colombia with 1 kilogram of cocaine is most probably not front-page news in Bogota but could be very important to the Romanian public if a local reporter manages to find out that the person who was caught with the narcotics is working for the government in Bucharest. Efficient investigative reporting is the result of cooperation between investigative journalists, programmers and others who want to use data to contribute to create a cleaner, fairer and more just global society.